It's four days since I won the world championship in Austin on Sunday but I'm still not sure whether it has properly sunk in yet. Life kind of just moves on. I stayed in Austin on Sunday night. The team had a celebration that I wanted to go to. It was important to me to spend some time with everyone, so I had a few tequilas with the guys and then I left because I had to be up early to catch a flight to Los Angeles. On the way from the airport into town, I was sitting there thinking: "I can't believe it's happened." And every morning since it has been kind of the same. But then you just kind of get on with stuff. It's always there in the background, which is kind of nice, but you're not thinking about it all the time. I just feel generally happy and at peace and relaxed. I had some media to do when I first got to LA on Monday morning but after that I had a couple of days just to myself. I know people must think you'd do something exceptional when you win the championship but it was really just a chilled time. I gave myself a couple of days off training and I was really able to relax. I couldn't go too crazy because we have another race this weekend in Mexico. But about 20 of us went out to dinner on Monday night and partied hard. That was a great night and a great celebration. I slept a lot on Tuesday, then went to the movies that evening, went to dinner and just hung out with some friends. Right now, I feel like it will be the end of the year before I do anything major because we still have three races still to go this season and they all matter to me. I said before the weekend in Austin started that I was not feeling any pressure or tension about the championship being so close, and that stayed the same way all weekend, although I really don't know how. Of course, everyone was asking questions about it, but I just went about it like any other weekend and I literally only realised I could win it 10 laps from the end of the race. The last safety car was about to come in and I was in second place behind my team-mate, Nico Rosberg. I believed I was going to get it anyway. I was not expecting him to make a mistake like he did and make it easy for me, but it is not so easy when you have someone like me in your mirrors. There is a lot of pressure. I'm aware that there has been a bit of discussion in the media about what happened between us after the race with the caps in the pre-podium room. I haven't seen Nico since the party on Sunday but we will be doing our briefings together today as normal. I guess we'll do what we always do in the team, which is talk transparently about anything that needs discussing. We don't want any tension inside the team but I'm a pretty chilled guy and I'm pretty chilled about it all. Since I was a little boy, I have wanted to win three Formula 1 world titles - because that's the number that Ayrton Senna won and it was one that meant a lot to me. So what now? Well, that's simple. Keep going. I just want to go racing. There are no particular goals, except to keep winning. I want to solidify the championship by going on to win the final three races of the year. That's my intention. I guess over the winter I'll come to realise what my next goal is, but I'm pretty sure I know what it'll be already - to win next year's championship. I love the feeling of what Mercedes and I have achieved together this year and last. I love the feeling in the team. And I want to try to deliver that again. Breaking records has never really mattered to me, other than doing something similar to Ayrton. Beyond that, if I was to match one of the others who have won more, it is not going to have the same special meaning that this has. We are racing in Mexico this weekend and it will be a first for me. I have driven the track on the simulator and it is going to be an interesting race. Mexico City is at an altitude of about 7,000 feet and that has quite a big effect on the cars. The thinner air reduces downforce and drag and I am very interested to find out what that is going to feel like that and how well we do here. Everyone has been so welcoming so far and this morning I walked into the paddock with my friend Spinz and my trainer Ville, all wearing sombreros like the Three Amigos. I am really looking forward to the experience of the weekend. 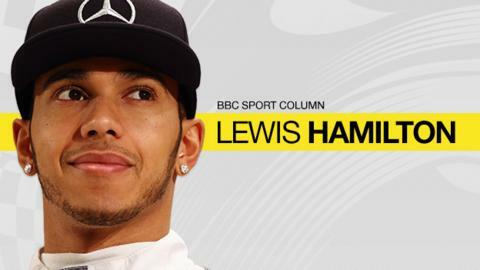 Lewis Hamilton was speaking to BBC Sport's Andrew Benson.